Dom Knowles and Chib Chilaka both bagged braces as Town scored seven second half goals against their lower league rivals. 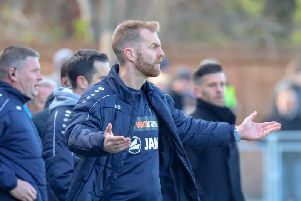 Lee Ashforth's relegated Railway had provided a stern examination over the first hour but were blown away by the superior visitors in a late salvo. The game was less than five minutes old when Jack Emmett felt the brunt of a derby-style challenge straight out of the North East Counties League. Railway’s Simon Parkes clattering through the back of Town’s tricky number 10. Town won another free-kick in the seventh minute, and following a poor clearance from Railway, Emmett was able to dance his way into the penalty area. After great footwork, the youngster picked out JP Pittman whose powerful strike forced Jake Lofthouse into a good save down to his left hand side. In the 21st minute, Station View held its breath courtesy of a moment to forget for Jack Lofthouse. As the goalkeeper came to head the ball on the edge of his box, he ended up knocking it straight into the path of Jack Emmett, allowing the tricky striker a sight on goal. Thankfully for Lee Ashforth’s side, Emmett failed to take full advantage of the chance. Just before the half-hour mark, Emmett’s trickery caused problems again, however his strike ricocheted in the area and flew over the bar. Town continued to press, and after 30 minutes Andi Thanoj had another chance to deliver from a corner, which was met by the head of Warren Burrell. Failing to clear their lines, the Railway defence presented a chance to Luke Shiels, who headed over from six yards. It took until the 36th minute for the deadlock to be broken, when Gregg Kidd misjudged the flight of a long ball, it presented Town striker Jordan Robertson the chance to notch his fifth goal in pre-season. Despite the gift from the defender, trialist Robertson still had it all to do inside the box. With the on-rushing Railway keeper closing him down, Town’s big number nine managed to keep his composure to find the bottom corner with the outside of his boot. Just on the stroke of half-time, Town played arguably the best football of the half. Andi Thanoj looked assured pulling the strings in midfield, and worked well well with Lloyd Kerry and Joe Colbeck down the right hand side. The impressive spell culminated in a teasing run from Jack Emmett, whose ball across the box failed to find a Yellow and Black shirt. Early into the second half Jack Emmett capitalised on a Danny Stimpson error, but saw his shot parried by Jake Lofthouse. The rebound fell to the feet of JP Pittman who had his strike cleared off the line by Simon Parkes. Moments before the hour mark, A well-worked move resulted in Town’s second goal of the afternoon. Jordan Robertson drifted out wide and after drawing two Railway defenders towards him, the striker fired in a dangerous ball which was excellently met by the energetic Lloyd Kerry. Kerry volleyed home to notch his first goal of pre-season. No sooner had Kerry finished celebrating was he withdrawn from the action. Simon Weaver’s wholesale changes saw the introduction of Tom Platt and Joe Leesley in the midfield, with Andy Gascgoine in an advanced role at the top of the diamond. Dom Knowles was introduced to the action on 62 minutes, and with his first touch found himself on the end of a well hit cross by Joe Leesley. Knowles’ header glanced past the Railway keeper. Knowles thought he had scored again in the 66th minute, but his back post header was disallowed after referee Matt Sowerby adjudged the striker to have pushed his defender. It didn't take long however for Town to add their fourth, as Joe Leesley benefited from sloppy defending to fire home his first goal in a Town shirt in the 74th minute. A fifth was added shortly after, with Chib Chilaka nodding home unopposed following a precise cross from strike partner Dom Knowles. The Town players were clearly playing for their place in Simon Weaver’s opening day eleven, as they continued to turn the screw in the latter stages of the game. With seven minutes left, trialist Joel Purkiss scored from 12 yards, followed by another Chilaka strike, making it seven. Dom Knowles wrapped things up when he made it 8-0 to Town, beating the offside trap and slotting home from close range. Harrogate Railway: Jake Lofthouse, Simon Parkes, Greg Kidd, Alex Lowe, Danny Stimpson, Michael Fargher, George Mason, Gregg Porter, Roy Fogarty, Steve Bromley, Ryan Sharrocks.